Dental assistants prepare patients for oral examination and assist other dental workers, such as dentists, dental therapists and dental hygienists, in providing treatment to the teeth, mouth and gums. Dental assistants also carry out reception and administration duties. Under the dentist’s direction, some dental assistants prepare materials for making impressions and restorations, expose radiographs, and process dental X-ray film. Dental assistants may perform the following tasks: receive patients and prepare them for necessary dental procedures; record findings from oral examinations; provide instruments and dispense materials during oral examinations or treatments; provide pre- and post-operative instructions for patients undergoing general or local anaesthesia; clear the patient’s mouth of saliva or dental materials used in the treatment by operating handheld equipment; clean and sterilise instruments and surgery after treatment; maintain and re-stock dental supplies; make appointments for patients, keep records of patients’ treatments and send out reminders for re-examinations; prepare accounts and collect payments; carry out other office duties. Why did you choose this career? I had finished matric and this job was advertised in the newspaper. I applied, and the rest is history. What training did you undergo? When I started out in 1983, there were no courses covering dental assisting and we were trained at the Faculty of Dentistry, UWC. There are now colleges offering this course. 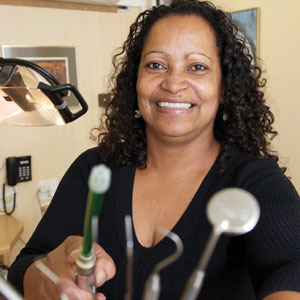 What personality traits make for a good dental assistant? You need to be a people person, as you have to work with all types of people and you share close personal space. Patience is a virtue! Is experience as important as formal training? Yes, experience is very important. In this industry there is always more to learn on the job, as products change all the time. Describe a typical day Every day varies. It all depends on what has been booked, from consultations to extensive oral surgery. What do you enjoy most about your work? Being able to assist the doctor in helping patients. Aspects that you’re not keen on? Travelling to and fro, from where I live to where I work. Public transport can be most unreliable. What’s been the highlight of your career to date? Changing jobs from working for a regular dentist, to working with a specialist – the best move ever. Any advice for someone starting out in your profession? You have to be interested and willing to learn. You need to enjoy what you are doing. Some dental assistants learn their skills on the job, with no formal training required. However, those that follow an in-service training course or study for a diploma or certificate in dental assisting have the advantage when it comes to getting a job. A National Senior Certificate or Grade 10 is needed to study most courses.